There is just something about pumpkins I just love! Maybe that's why I was attracted to this tablecloth! It's pumpkins and more pumpkins! 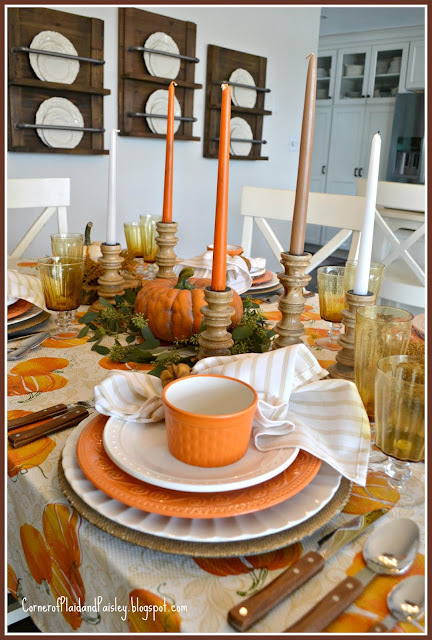 I love these sweet little wooden pumpkin napkin rings. The orange pumpkin in the centerpiece just reminds me of Cinderella's carriage! We had a beautiful fall day yesterday, even ended the day with a friends around our fire pit roasting marshmallows for S'mores the way you should celebrate fall! I hope you are having a wonderful fall. This is lovely Ann. That pumpkin does look like the one for the Cinderella carriage! 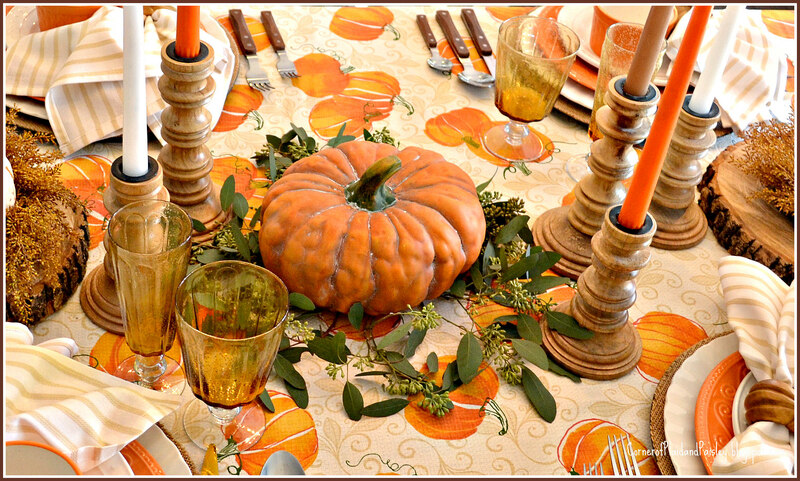 Great tablecloth and candles. I like the dish stack and the napkin choice. Roasting marshmallows sounds delightful! 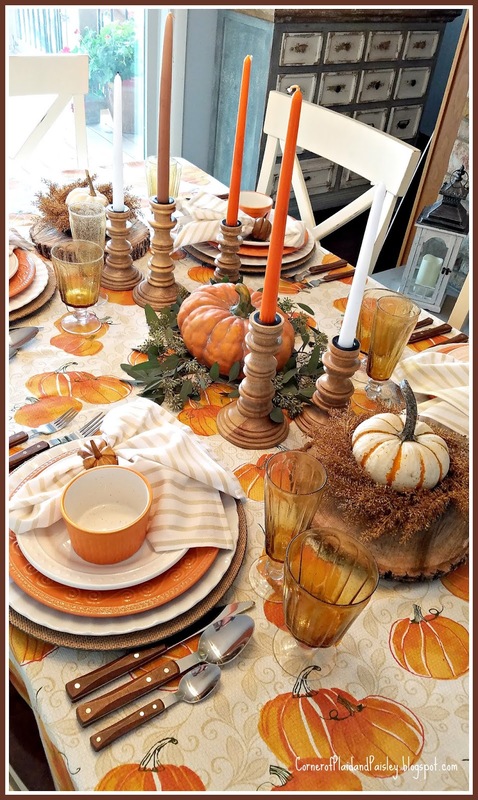 What a lovely and colorful pumpkin table....love it and all the orange dishes. What a great fall table! I love your tablecloth, and those napkin rings are perfect! I am crazy about your tablecloth and napkin rings Ann, so cute! I am pretty much crazy about anything pumpkin! This is all adorable, and I look forward to firepit times, still in the 90s in the South!! Those napkin rings are wonderful. They seem to have quite a lot of detail. And you've got me wishing for amber stemware -- so pretty and just right for fall. Well, I just lost my comment! I am crazy for pumpkins also, Ann! 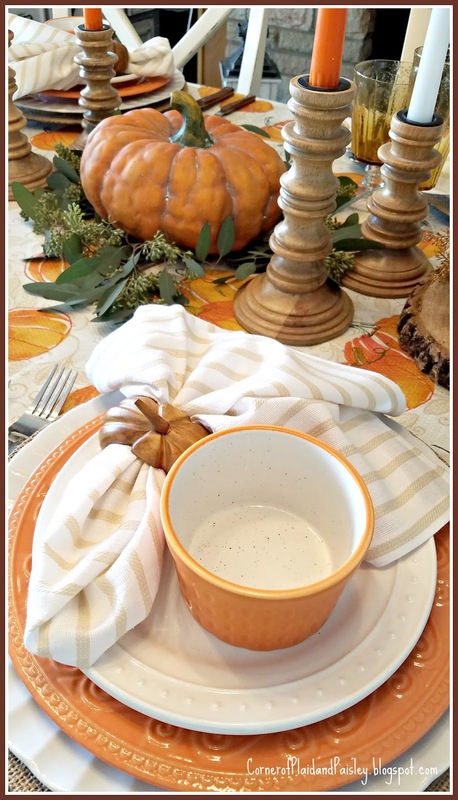 The pumpkin tablecloth is the perfect underpinning for your plate stack and the orange ramekins are wonderful! The napkins, napkin rings, and the Cinderella pumpkin centerpiece are fabulous! S’mores and fire pits sound delightful if our 90+ degree temperature would break! Happy Fall! Ann your tablecloth is perfect for your plate stack and orange ramekins. I love the Target dollar spot, too. You did a great job with the amber stemware and the napkin rings are adorable. I want to sit and enjoy a cozy dinner on your beautiful table. I almost forgot....Thank you for joining our Celebrate Your Story link party. This is just too cute! I love your not so scary scene. As I have gotten older and grown in my Christian faith, I have gotten away from the really scary decor and toned down on the Halloween quite a bit and I am always looking for whimsical or elegant Halloween decor that won't really frighten kids. I suppose the skeleton hand on my tablescape is a bit creepy though! Your litte pumpkins with the bows are just the cutest things ever. I may have to borrow that idea to make pumpkins with bows for my nieces. So happy to be hopping with you! As always you are welcome to share with us at Thursday Favorite Things and/or the Hauntingly Beautiful Decor Halloween link party. Oops I accidentally scrolled down to far and commented on the wrong post! 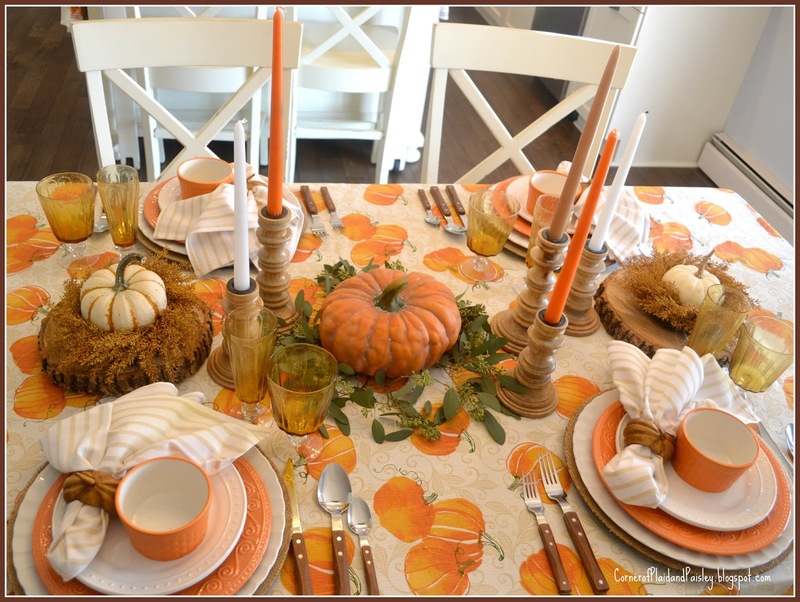 Love this tablescape too!